and our clients and their dogs are tearing it up. 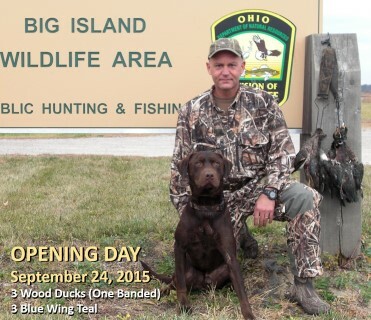 Al Faber and his boy Drake had a great hunting trip. 6 ducks on opening day, followed up by bagging 3 pheasants the next weekend. The New Puppies are Here! The New Puppies are Here! 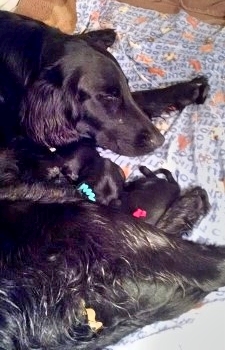 After th ree years without puppies, Gamekeepers is pleased to announce that Marlowe (CH Gamekeepers Femme Fatale JH WC) and Kasper (CH MACH2 HRCH Wingmaster’s Kasper MH MX MXJ WCX HOF) are the proud parents of 8 healthy little ones. Marlowe had 6 girls and 2 boys on October 22, 2015. Effective September 1, 2015, Kyle Crump is no longer employed by Gamekeepers Retrievers, Ltd. We hope you join us in wishing Kyle well as he pursues other endeavors. We’ve received amazing news from Larry and Linda Meek about their boy Chance, MACH2 Gamekeepers Luck of the Draw MXG MJC CGC. 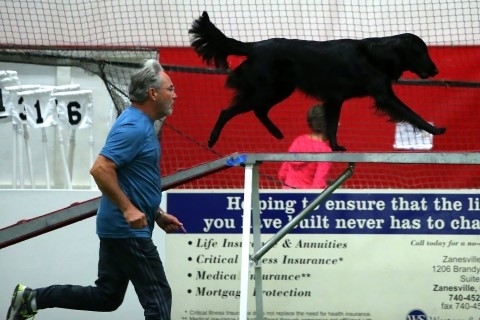 Chance has crossed the top 25 mark of all time high scoring AKC Flatcoats in Agility! He is currently in the Number 24 spot and climbing. He also just reached his century title (100 qualifying runs ) in Master Agility Jumpers and is only seven runs short of his century in Master Agility standard. Chance accomplished all this with only trialing about once a month. This last weekend Chance was 5 for 6 with his Mom, Linda, running him and earned a third and a forth place ribbon. This trial had 5 World team members there from past and present so the competition in central Ohio is tough. Chance only needs 4 double Qs for his MACH 3. He needed 750 points and already has 1150. Larry and Chance’s goal this round was to increase speed and Jenn Crank has been kicking their butts to get it. We are very proud of all that Larry and Chance (with occasional assists from Linda) have accomplished! What a great team effort! Chance is one of Charm’s sons (CH Amani Bedazzled MH WCX “Charm” x CH Gamekeepers Time and The Bell CD “Milo”). Prince Charming is on a roll! Prince Charming has been on a roll in the show ring since returning to Goshen, IN in early March to hang out with his BFF’s Lisa Bettis, Ryan Wolfe and Natalie Taylor. In their first shows back together, Lisa and Prince Charming swept the breed in the Louisville cluster. Within the first 3 weeks, Prince Charming earned enough breed points to take over as the #2 Flat-coat (#1 male) in the Canine Chronicle Breed Rankings and as of May 31st, he is ranked #4 in All Breed (Canine Chronicle). In three months, Prince Charming’s won 16 group placements including back to back Group 1 wins on June 13-14 in Fort Dodge, Iowa. We are so proud of this handsome, young dog and we can not wait to see what the future brings! and the silence is broken! Sorry for the lack of updates over the long, cold winter, but updating the website took a back seat to a personal loss. My wonderful Uncle Mike (Michael H. Helberg) passed away in January after a long series of health battles. Uncle Mike was one of a kind and lived his life to the fullest, leaving nothing left undone. His generosity, thirst for knowledge, love of people and zest for life made him larger than life. It was like someone sucked the air out of the room when he left us. We all miss him greatly. Mitch, Kyle and the dogs had a fantastic winter down in Clermont, Florida, made doubly wonderful by the fact that I was able to join them and bring my mare, Stone. We have loved every minute of our time here. We would like to sincerely thank Wayne and Sharon Gey for their friendship and hospitality. We are blessed to know you and count you among our friends. Stay tuned. 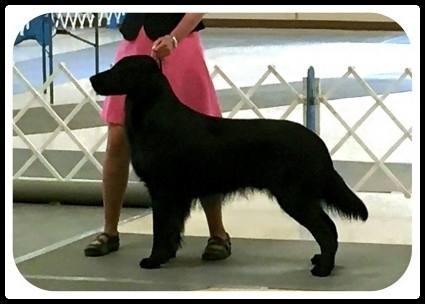 I will be posting a long list of brags starting with some hunt test accomplishments and continuing with our great showing at the 2015 Flat-coated Retriever Society of America’s National Specialty. Santa came to the IX center in Cleveland and he was very good to Gamekeepers! 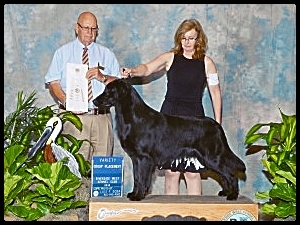 Alex, CH Gamekeepers Big Red 1 SH, earned his CH plus his first GCH points – a 4 pt GCH Major. 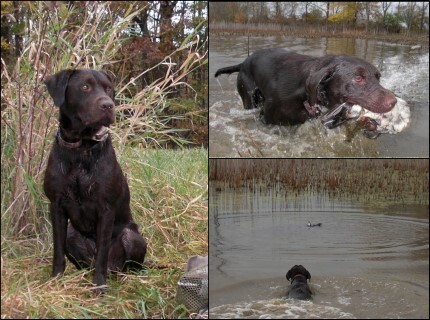 Chick, CH Gamekeepers Boom Chicka Wow Wow JH, finished her CH. 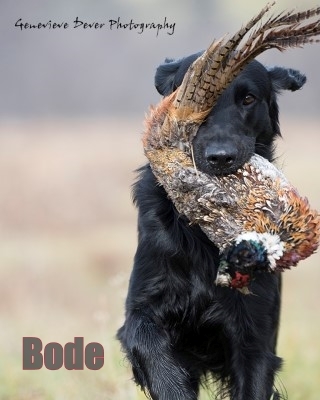 Bode, Gamekeepers Double Black Diamond JH WCX, earned his second Major and Cal, GCH Gamekeepers Iron Man CD RA JH WCX, turned in two brilliant Novice B performances (198 1/2 and a 198). What great way to end the year! Thanks and an extra Merry Christmas to our fantastic owners and their fantastic dogs Linda and Rob O’Leary (Alex), Ray and Eloise Girt (Bode) and Deanna German and Ed Zawodny (Cal) and to our extraordinary handlers Bryana Pierce and John Benoit.